Maritime Increasingly "Sends in the DRONES"
For our readers not aware, please discuss the size and scope of RIMS BV. RIMS is a global service provider to help revolutionize maintenance strategies with smart drones and robotic inspections. We offer expertise, as well as the market inspection of enclosed spaces with your drone, (and we have) a lot of experience with inspection of different assets (such as ships, storage tanks, chimneys). Please discuss your tenure with RIMS. My name is David Knukkel and I am a Senior Maintenance Consultant/Asset Manager in the Maritime industry (www.knukkel.com) and CEO of RIMS BV (www.rims-bv.com). I have 10 years of sea experience as an officer on container vessels of 2,000 to 8,700 TEU. After coming ashore I spent two years as superintendent for Reederei Blue Star. I worked with Wärtsilä Switzerland as a full maintenance Contract Manager, and afterwards as a Senior Maintenance Consultant for Boskalis and the last couple of years for Smit Lamnalco. In 2015, I founded RIMS, and started to scout new technologies to bring maintenance to the next level and replace high-risk and resource-intensive maintenance activities with smarter drone and other robotic technologies that are more sustainable. What is the scope of robotic products and services offered? At this stage we focus on the internal drone inspections, as we believe that in many cases flying inspection tools will win (business) from the crawlers, although the latest have certain advantages like carrying measurement tools. The challenge with crawlers is that the magnetic wheels do not hold on rusty environments, areas which we would like to inspect in the first place to ensure that the integrity is still okay. Nevertheless we made an offer once to use combined inspection tools to inspect dredge piping on board of a vessel. Do you manufacture your own drones? We do not manufacturer the technology ourselves, but source it from a manufacturing company in Switzerland. Our expertise is not only flying the drone, but also having all systems and certification in place to support customers and classification surveyors by introducing safer and cost efficient working practices. We have hands-on experience in the industry we are working in, so we also have the expertise with all requirements, either from clients as from class. Is your company designed to sell product, sell service, or both? Depending on the operation profile of the customer we can advise whether it makes sense to use our services or keep the knowledge in-house. In most circumstances I recommend to use a specialized service provider, as operating and maintaining expensive and high tech equipment is part of their core business, and they make sure they fully comply with all regulations. Many companies underestimate what is required to keep a professional team in place to do all the inspections. By industry, can you discuss the diversity of your business today? We are focusing on inspection of assets in the oil and gas and the maritime industry, as this is our background and have large needs of internal remote inspections from safety perspective. As these assets are usually inspected by rope access, scaffolding and/or cherry pickers we can also reduce the costs by not using these tools anymore. It is good to realize that with rope access, ropes often damage the coating of the areas where they are attached, increasing the speed of corrosion. We see that now also the insurance surveyors ashore for utilities are showing more interest. Put in perspective your growth forecast for robotic inspection services in the maritime sector. I expect that the growth goes exponential the coming years. As said the awareness is growing very fast and this time the regulators like the classification societies are upfront of the technology: we have obtained class approvals as remote inspection specialist using drones by Bureau Veritas, ABS, Lloyds, ABS, RINA and KRS. The approval process for ClassNK has started up. 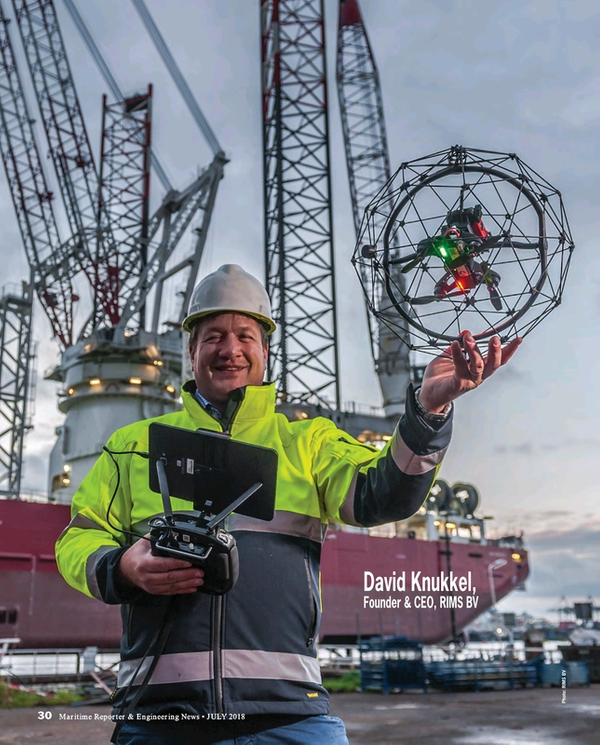 DNV-GL does not approve us (yet) as they have their own drone teams in the market using the same technology. It is in the benefits of the surveyors to use this technology so I think that they will be a major driver to bring it to the market. Another trend I see is that many youngsters do not want to go into tanks anymore. The next generation is used to work with tablets and do things remotely; keeping them aligned with the required inspections and the introduction of new technology is a must. Looking at the maritime and offshore sectors, are there any specific niches where business prospects look particularly good? Ship and rig owners are our biggest clients, as they will have the biggest benefits by working safer and cost efficient during surveys, vetting inspections, pre-docking inspection, brokerage inspections, in- and out surveys and so on. We see an increase of shipyards which would like to try to use the technology, but are still unsure of how to fit the new technology into their business profile. We support them with it. Looking forward, where do you see further developments? We have a roadmap of new technology to be developed to make remote inspections even more efficient and safer. Technological partners are found, and we are now in the process to attract investors to step in and allow us to make the next steps forward. Think about developments in the area of thickness measurements, ATEX, automated reporting, autonomous flights and so on.